Ranking athletes is a common problem across all sports. In Mixed Martial Arts (MMA), one of the most popular ways of summarizing fighters is based on their primary method of winning. The major winning methods are: (1) KO/TKO: a fighter uses punches, kicks, etc. to either incapacitate the opponent (KO) or force a stoppage (TKO), (2) Submission: through chokes or joint locks a fighter forces his/her opponent to tap out, (3) Decision: the fight goes its full length and a panel of judges declare the winner. The relative value of these three win methods is an important summary of a fighter’s style which is both reported by UFC’s pre-fight summary and is one of Sherdog’s main summaries of a fighter. 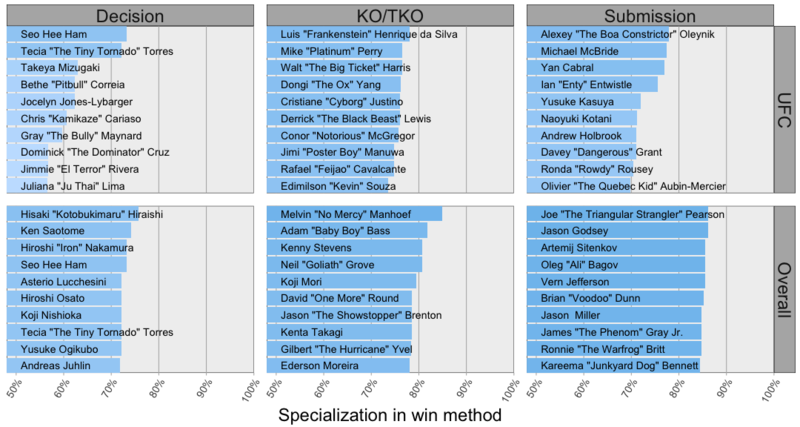 Despite the importance of win method preference for summarizing fighters, it is difficult to rank fighters by their method preferences (the % of all wins by each method); using this metric, amateur fighters (with few wins to date) will often appear to be more specialized than experienced fighters. For example, a fighter who has won 3/3 times using strikes would appear to exclusively win by striking, while a fighter with 49/50 wins by striking would seem less specialized. Clearly, the latter fighter is probably a stronger striker because he/she has repeatedly demonstrated this preference, whereas there is more uncertainty about the former fighter. Here, I formalize this intuition by balancing fighter-specific results with patterns across fighters using a statistical approach based on empirical Bayesian analysis: a hierarchical Dirichlet-Multinomial model. Using this approach, I can fairly rank fighters accounting for their variable experience. Based on these experience-corrected rankings, Conor McGregor and Cris Cyborg are among the top 10 striking specialists in the UFC (K1 veteran Melvin Manhoef is top overall). Ronda Rousey and Dominick Cruz are top 10 in the UFC for winning by submission and decision, respectively. MMA fighters use a mixture of martial arts and the way that they win fights reflects their personal style. Using data from ~120,000 wins across 35,000 fighters, I determined how frequently each pair of 50 common finishes was used by the same fighters relative to chance, allowing me to identify ~300 pairs of finishes that are commonly used together by fighters. These finish pairs can be used to more broadly organize finishes, grouping finishes that share similar partners. In MMA, momentum is huge. Fighters who continue to extend their win streaks by dominating opponents can quickly work their way up the tables, awarding them the opportunity to fight tougher opponents, move to higher caliber fight organizations and maybe, ultimately win a title shot. On the flip side, it can be hard for fighters to recover from a loss; often a single loss is often a sign that a fighter’s confidence is shaken and their future performance will suffer. In this post, I address one aspect of momentum in MMA: how a fighter’s performance in one fight affects their performance in their next fight. Summarizing the careers of over 150,000 fighters, I see that wins at any stage of a fighter’s career are an indicator of future success, while early losses are often enough to force a fighter to rethink their MMA dreams. Previously, I discussed acquiring and standardizing a compendium of fighter and fight-level MMA results. I: Scraping fighter and fight data: Aggregating data from ~250,000 MMA fights between ~140,000 fighters. II: Cleaning up fight-level data: summarizing the major ways that fights are won. III: Cleaning up fighter-level data: summarizing where fighters are from and major weight classes. In this post, I will go over how the previously created fight, fighter and event-level tables can be transformed into a MySQL database that can both be created and accessed using R.